Giant-Size Geek: Brian Bolland Leads the British Invasion in 1984! Brian Bolland Leads the British Invasion in 1984! DC Comics brought in a number of great creators from the United Kingdom, starting in 1984, and if you had read any imported comics like 2000 A.D. or Warrior magazine, you were eagerly anticipating their work on mainstream DC heroes. If it was not obvious what was happening, this cover by Brian Bolland on Amazing Heroes #52 made it very clear. 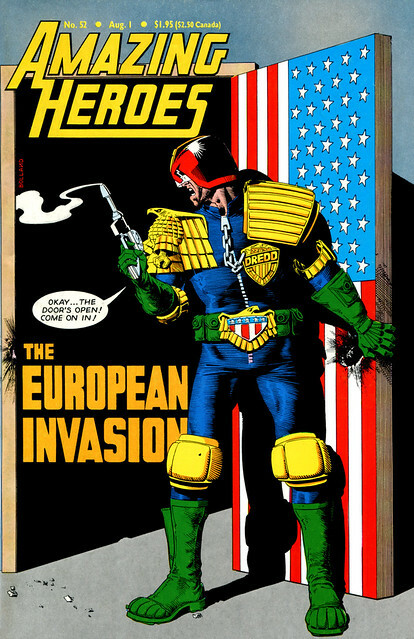 Judge Dredd, the character who had cracked the American market with superb artwork by Bolland and others, had opened the door for other creators from the UK. 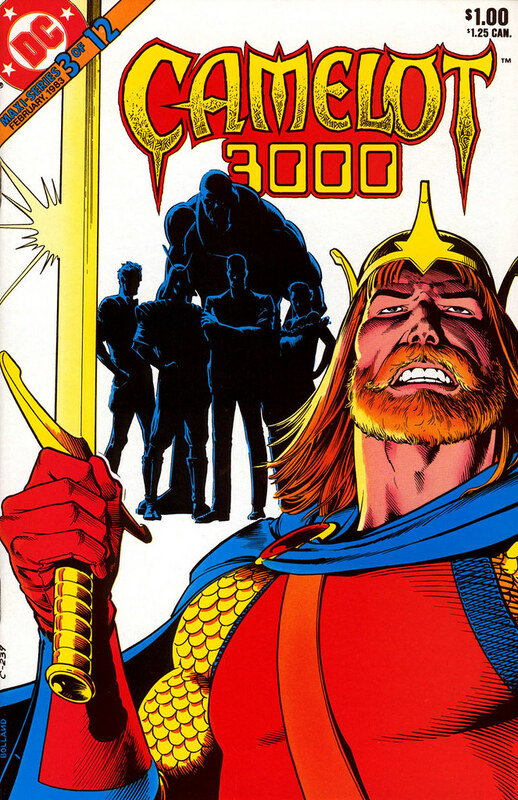 Bolland was almost finished with Camelot 3000 by the time that Amazing Heroes cover was published. Eleven stellar issues had been published—though we would have to wait about a year for the final issue (#12) to finally appear in 1985. 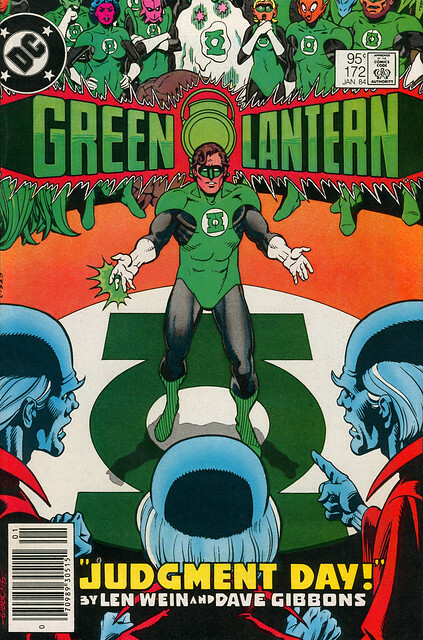 Dave Gibbons became the regular artist on Green Lantern in 1984, joining writer Len Wein for a series of stories that would see John Stewart take over as Earth’s Green Lantern for a while. 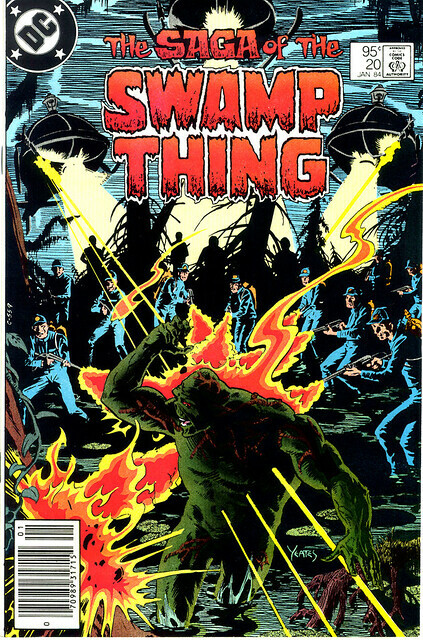 Alan Moore’s first issue of Swamp Thing was cover dated January 1984, meaning that it probably appeared in stores around Oct-Nov 1983. I remember picking up this issue, without having read any of Moore’s previous work, but willing to give him a chance. I thought it was a very good story and showed a lot of promise. My jaw would drop to the ground when I read the next issue (#21) which contained The Anatomy Lesson. That one prompted me to buy anything and everything written by Moore, including the Warrior magazines with the Marvelman & V for Vendetta stories. 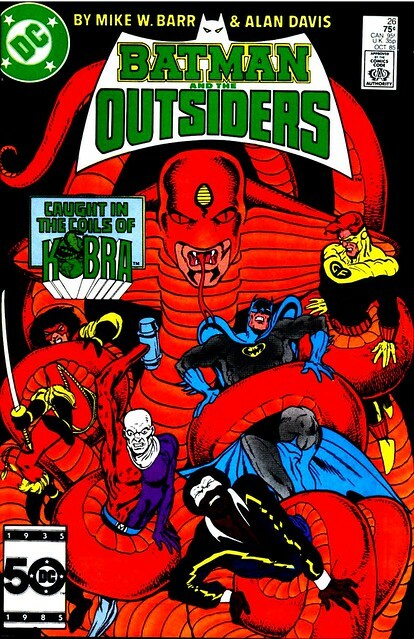 Alan Davis joined a bit later, in 1985, when his stint began on Batman & The Outsiders. I enjoyed his work on this title, although when I re-read these issues now, his style was a bit rough and his storytelling was yet as “epic” as it would become in later years. Later in 1988, we got a second wave of creators from the UK. Jamie Delano started on Hellblazer #1, along with John Ridgway. Neil Gaiman and Dave McKean’s Black Orchid mini-series was also published in 1988. It was a revolutionary period for comics fans! Nuff Said.